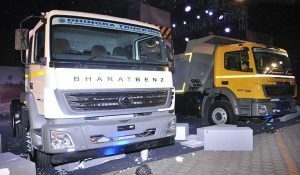 BharatBenz on Saturday said that it has launched its new heavy duty truck range here, equipped with a system based on “SCR technology” to meet the new BS-IV emission standards. According to the company, the new models are introduced at the price range of the brand’s earlier BS-III trucks. “The BharatBenz product range of trucks above 9 to 49 tonnes has been available as BS-IV variants since August 2015. Even before the transition to the BS-IV standard on 1st April 2017, more than 1,000 BharatBenz BS-IV trucks had been delivered to customers and clocked up more than 42,00,000 kilometres,” the company said in a statement. “Delhi and NCR remains one of BharatBenz’s key focus markets. With our all-new BharatBenz heavy-duty trucks, we aim to convince many additional customers in the region – thanks to our best-in-class ‘profit technology’ package of productivity, efficiency and safety with BSIV emission norms,” said Rajaram Krishnamurthy, Vice President, Marketing and Sales, Daimler India Commercial Vehicles (DICV).